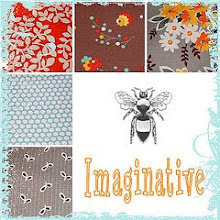 If I have one favorite go to fabric for baby quilts, this is it! I’m so in love with these Heather Ross goldfish! These two little quilts were made and gifted last weekend to summer friends who are having twin boys in a couple months. I had such a great time pairing these cute little goldfish with some other fun fabrics. 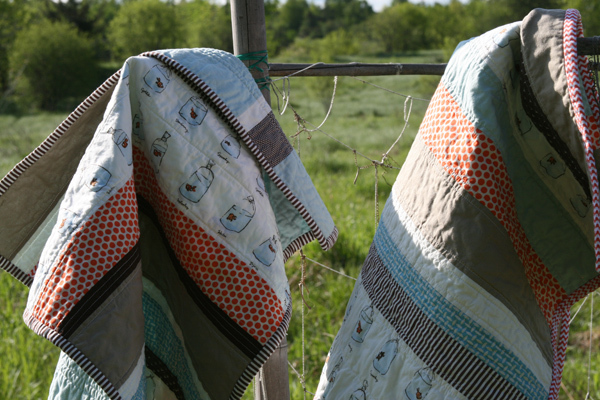 I love the goldfish print in a strip quilt, since I think it’s fun to see a whole row of goldfish. In the past I’ve made similar strip quilts, using turquoises and oranges, or blues and browns… and this time I added in one of my favorite neutral solids, Kona Stone, as well as a bunch of orange, blue and brown prints and solids. 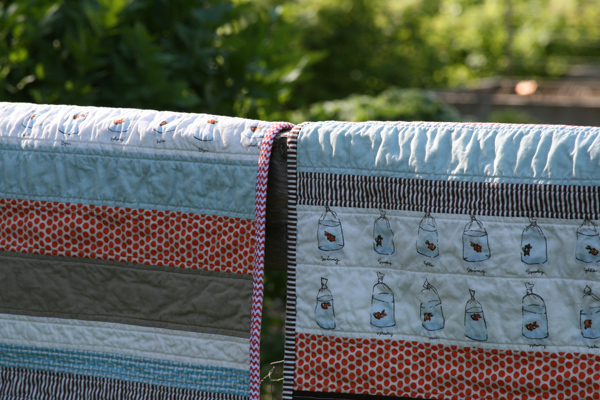 Both are quilted with simple straight lines, sewn 1/4″ away from each seam, and then bound with those cute stripey bindings! I hope they will be well loved! For those who might ask — the Heather Ross goldfish fabric is now out of print, but if you’re looking for something similar, you might look for the Heather Ross Munki Munki version of goldfish in bags. You can buy some over here from Kerri! 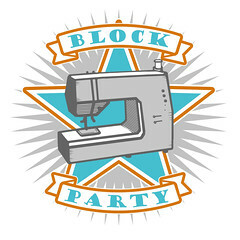 This entry was posted in [search] Strip Quilts, 2010 Finished Quilts, Finished Quilts, Posts about Quilts, Quilts and tagged baby boy, baby gift, baby quilts, goldfish, handmade, Heather Ross, Posts about Quilts, strip quilt. Bookmark the permalink. Love love love! Those are some lucky twins! A D O R A B L E!! the goldfish is one of my favorites!! love how you made it into a simple but cute strip quilt!! Those are great, I love the goldfish! I love, love, love these!!!! I really, really, really want some of those fish! They are my favorite! Darling Darling quilts! Good work there, so creative you are! So that’s what they were for.. well you did a super awesome job! I LOVE it! 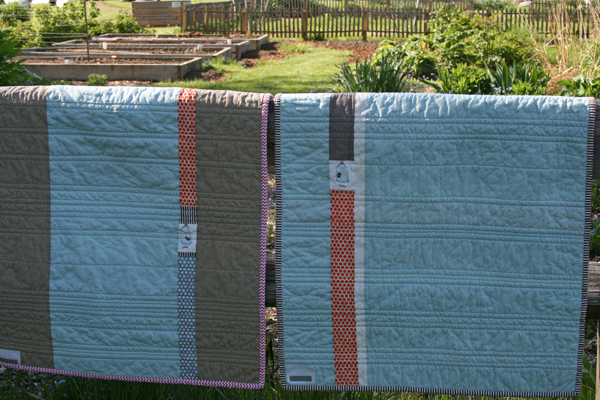 Lucky twins getting one of your quilts each…and, lucky couple having twins…I have twin girls. They’re fun! Those are so beautiful, I love them, the twins are very lucky! These are awesome! I was just about to start a blue and brown strip quilt inspired by your blue and brown one. This is such perfect timing, because I was thinking about how I wanted to quilt them and I want to do it like you did these. I wasn’t sure how the random lines would look on the back, but they look fantastic! Do you mind telling me what size you made them? That is the last decision I have to make, and then I am going to start cutting. Thank you for all the inspiration you provide! Love them! They seem perfect for twin boys. I bet these quilts will be cherished their whole lives. I love how you make these munki munki prints work in your projects, so I have started to collect a few pieces from Kerri’s shop. So very cute! I’m sure they will be well-loved! Soooo cute! I am sure they loved them. Your gift must have been the BEST one. Great quilts! 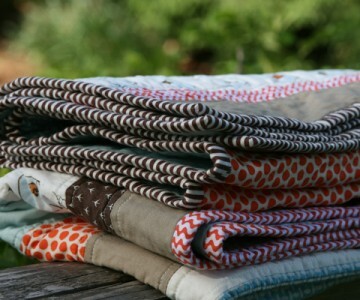 I’ve got to make some baby quilts and I think I will try a strip quilt this time – These are so fresh and new! I am always inspired by each and every one of your AMAZING quilts! Ashley, you are killing me with these goldfish quilts- these are my favorites of all the ones you have made so far! So much so that I broke down and bid a rediculous amount of money for a half yard of the goldfish fabric on ebay….we’ll see if anyone crazier outbids me! I especially love the backs- what is the Kona blue you have here paired with the stone? It looks fantastic. I love the goldfish in a row, too! And the singleton fish on the back! So cute! I know this is years later but I am in love with these quilts. Any possible way you have it anymore to purchase?